Building your company’s LinkedIn profile isn’t that hard. You should start by customizing your URL in LinkedIn using your business name. If you have a company banner or logo, make sure that you add it in your profile as this will help your viewers associate you with the right image. Part of building your LinkedIn profile is using relevant keywords. Think about what best describes your business and what your clients will be looking for and use them in your profile. Best LinkedIn profile writers working at us Don’t forget to add your products and services too so that your viewers will know what to expect from your business. A company profile has to be written in professional way – at all times. Your profile serves as the company’s face on LinkedIn and other media platforms. It affects how professionals perceive the company. A company is more likely to attract applicants if it is positioned as an authority in the industry. Professionals want to work for a company that upholds professionalism motivates others to conduct the same. People might not see the company in person but they can tell if you are sincere enough through your choice of words. A professionally written company profile makes employees feel elated with their association with it. They see the company as a tool to get connected with other professionals in the industry. It helps you widen your connections as well. The professional tone of voice in your profile reflects your company values and goals, which also transcend to your employees and future connections. Since you are building a LinkedIn profile for your business you should also include a service page because this will help in making your brand known. You can market your business through the company description box which allows you to write 250 up to 2000 words. Just make sure that you integrate the link to your company’s main website so you can direct your viewers to where you want them to go. Your service page in LinkedIn is valuable to your online presence since it is here where you will get to give your visitors a glimpse of what your business is all about. That is why it is imperative that you supply them with relevant information then direct them to your website where they can get to know your business even better. Hire a professional to write a profile for you. Highlight years of experience, company values, and advocacies that you support. Use active voice and action words in describing your company. Highlight company’s achievements and future goals. Mention awards, achievements, and certifications. Mention how you value employees. Update your profile once in a while. Talk to us now. 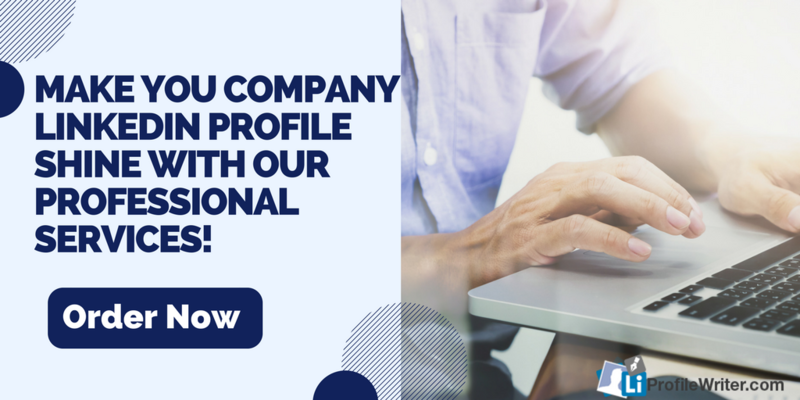 Let’s work on your professional company profile today! Your company can enjoy these features with the help or our services. We help companies create professional profiles. We use marketing and journalism tested techniques to develop a profile that look and sound professional. With our techniques, people from the industry and across boards will be thrilled to get connected with you. Our profile writing services give your company the advantage to be recognized by competitors, employees, and future investors. We help you create your own face through LinkedIn – a face that people will recall to have given them a professional outlook. We also highlight your brand, company values and experience and position you at the top of your game. Make your Company LinkedIn Profile shine with our Professional Services!